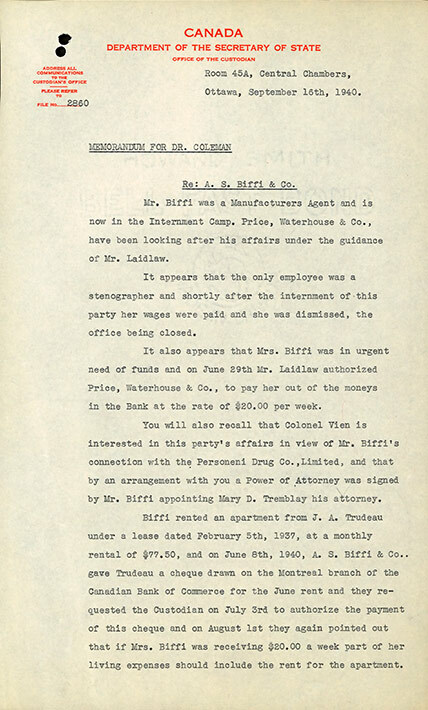 This memorandum was written for Dr. E.H. Coleman, Under Secretary of State and Custodian of Enemy Property, regarding A.S. Biffi & Co. During the war, Coleman's responsibilities included the internment of enemy aliens, custody of enemy property and press censorship. The memo is signed by G.W. McPherson, counsel for the Custodian. This document reviews the situation pertaining to the assets of A.S. Biffi, and also notes the interest of Thomas Vien, MP, in this case (see LDICEA2012.0017.12.a-b).